Each piece is individually signed by Richard Edlund! 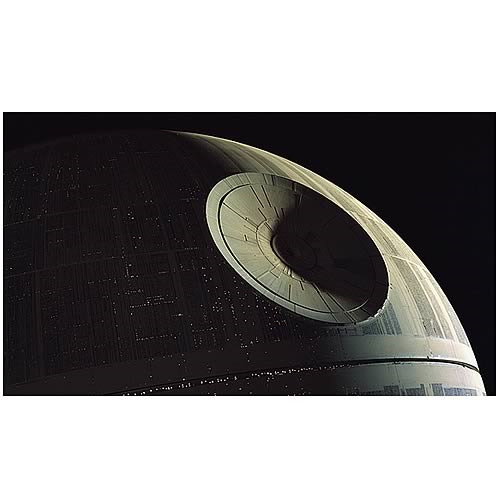 "The Emperor's Ultimate Weapon" is a limited edition, canvas-giclée print created from a Death Star model photo taken by Richard Edlund, the multi Academy Award winning special effects photographer well known for his work with Industrial Light and Magic. The eerie, ominous image measures 19-inches tall x 33-inches wide and is personally signed by Edlund. It's limited to a mere 100 pieces and arrives with a certificate of authenticity. Bring The Emperor's Ultimate Weapon to a galaxy near you… if you dare!